My column for the Uniontown Herald-Standard to be published on April 3, 2014. 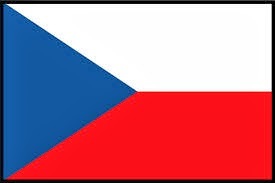 Because of the proximity/history the Czech Republic (formerly Czechoslovakia) and Slovakia are ultimately tied together and will be referred to as Slovaks in this column. They were joined, broken apart and more!! Upon arrival in the US they were called “Hunkies” because of their escape from Austro-Hungarian oppression but actually weren’t Hungarian. Again immigration officials lumped nationalities together. These uneducated peasants settled in Homestead and Munhall to work in the coal fields and steel mills & were given the hardest jobs and received the lowest wages!! By 1907 52% of the Pittsburgh steel workers were of Slovakian descent. Over 40% of them took in boarders in crowded tenement buildings just to survive. Fayette County in 2000 traced 6.6% of its population to Slovakia and Allegheny County’s Mon Valley towns of Whitaker, Munhall and West Homestead have the largest Slovak concentrations, ranging from 22 to 19 percent. Eventually they became known as hardworking, reliable, patriotic and honest citizens. Their lives & entertainment were centered on community, church and family. The majority of the Slovaks were Roman Catholic but some owed their allegiance to the Russian Orthodox Church & often were mistaken for Russians. Since they had such long hours they spent a lot of their income on “stick-to-the-ribs” foods which meant meats and breads and not too many vegetables (more expensive and longer prep time). Soups were popular especially for work lunches: Rasca Polievka (caraway), Staromódny Zemiaková Polievka (old fashioned potato), Ciberja (potatoes, buttermilk, eggs and green or wax beans) and even a sweet dessert soup called Sladký Dezert Polievka. Dumplings such as Knedlyky (cottage cheese filling), Halusky (varied fillings) and Pirohy (pierogies) (filled with potatoes or cottage cheese) were popular. NOTE: Our family would buy Pirohy (pierogies) freshly made from an area church on Friday nights. Syry (cheeses) are popular: Ostipok (salty sheep cheese), Parenica (semi-soft unripe, steamed cheese) and Vyprážaný Syr (fried cheese served with French fries and tartar sauce). Meat dishes included Kielbassi, Vepřo-Knedlo-Zelo (Pork with dumplings and cabbage), Plnená Kapusta (stuffed cabbage), Goulash (beef or veal, potatoes, carrots, onions), pork, goose and sausages. 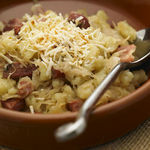 Also popular with meals were Kochania (jellied pig’s feet) and Kapusta Ochutenie (sauerkraut relish). Beverages included Kofola and Zincica (soft drinks), aperitifs, wine, beer, vodka and liqueurs. Desserts included Zemlovka (fruit pudding), Babovka (pound cake), Palacinky (pancakes), Orechové Rožky (nut rolls), Torty (cakes), Palacinky (crepes), Cheregie (deep fried desserts), Bublanina (cherry or blueberry squares), Kolachky (filled squares), Pretazeny Ornamentami (gingerbread) and Cukríky (candies). For holidays and family occasions there were special dishes such as Palnina for Easter (veal loaf served cold, sliced or cubed) on a platter with other foods such as Cirek (Easter cheese), ham and Kielbassi. There was a Vianočné (Christmas bean dish), a Kyslá Hubová Polievka (sour mushroom soup) and even a Nové Matky Jačmeň Polievka (new mother’s barley soup). NOTE: The S&D Polish Deli in Pittsburgh’s strip district carries Polish and Slovakian foods. I would recommend it. The food is great!! You can order products on-line also. SLOVAKIAN PREVIOUS POST ON ANOTHER BLOG OF MINE. They were referred to as "Hunkies"
Link above to death of owner of Strakas Bar on Ann Street in Homestead, longest surviving Slovakian Bar. END OF SLOVAKIAN PREVIOUS POST ON ANOTHER BLOG OF MINE. The PA Melting Pot - What is mead?